Intel will launch the products under a new brand name, Intel Optane. Intel has said the first solid-state drives to use its new 3D Xpoint memory technology will ship next year, under a new brand called Intel Optane. Intel first described the technology last month. It was codeveloped with Micron, and the companies say it’s the first completely new technology for memory and storage devices since NAND flash was introduced 25 years ago. Intel will ship Optane solid state drives for products ranging from servers down to low-power laptops in 2016, the company announced at its Intel Developer Forum in San Francisco Tuesday. It will also ship memory DIMMs for use as main system memory in servers, though it wasn’t immediately clear if they’re coming in 2016 as well. The DIMMs will work with future Intel Xeon server processors. The new memory type sits somewhere between DRAM and flash in terms of functionality. 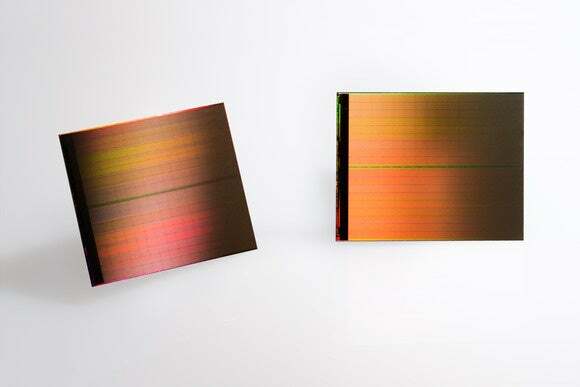 Intel and Micron say it’s 10 times as dense as DRAM, but can operate up to 1,000 times faster than Flash. And like Flash, it’s a non volatile memory, which means it holds its data after the power is turned off. 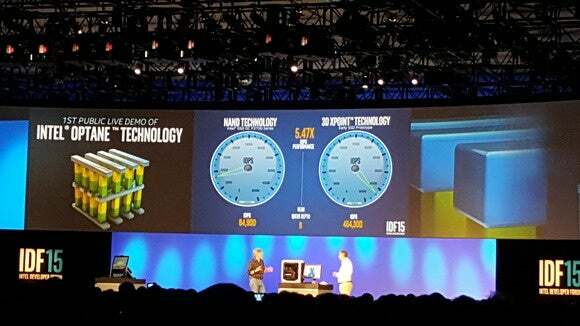 CEO Brian Krzanich gave the first public demonstration of 3D Xpoint in a prototype solid state drive Tuesday. It wasn’t as fast as the companies claim it will eventually become, but a test showed it operating at about seven times the speed of Intel’s fastest NAND flash parts. The companies say the technology is needed to handle the increasing amounts of data used in everything from corporate analytics programs to computer games. “We’re hitting a bottleneck with current storage architecture,” Krzanich said. It will allow the creation of far more realistic and immersive computer games, the companies say, allowing entire scenes to be refreshed instantly instead of gamers needing to wait for them to load from a disk drive. It’s also being positioned for running huge in-memory databases, so companies can do real-time analytics on much larger sets of data. It’s a brand new memory design that uses a lattice of wires that can be built out in three dimensions. Each cross point on the wires is a tiny switch. The ones and zeros are represented by altering the state of the material at those cross points. Along with the drives, Intel will introduce related storage controllers, interfaces and interconnects, it said.